With the versatile, hand-hammered Ruffoni Symphonia Prima 4-Quart Covered Chef's Pan with Helper Handle, time-honored artistry and contemporary design unite for classic beauty and lasting culinary performance. Ruffoni Symphonia Prima brings the highest-quality Italian craftsmanship to this "molto glorioso" line of stainless steel cookware. This hammered stainless steel chef's pan appeals to gastronomes of every level and is designed with a thick aluminum core between layers of mirror-polished stainless steel, offering both truly exceptional heat conduction and a luxurious kitchen aesthetic. Prepared to deliver the richest, deepest gourmet flavors and textures, this chef's pan is ideal for wilting baby spinach in olive oil and garlic, or for simmering truffled red wine risotto with parmesan broth. A shapely cast stainless steel handle is dual riveted to the pan and features stamped copper signets, as does the mirror-finished stainless steel lid. It also boasts a helper handle to aid in moving the pan between kitchen stations. 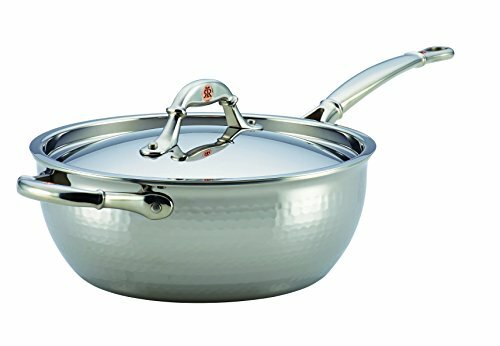 Oven safe to 450 DegreeF and suitable for all cooktops, including induction, this alluring Ruffoni stainless steel chef's pan is a beautiful addition to other heirloom-quality pieces from the Symphonia and Mini collections. Take culinary adventures to the next level with the Ruffoni Symphonia Prima 4-Quart Covered Chef's Pan with Helper Handle. If you have any questions about this product by Ruffoni, contact us by completing and submitting the form below. If you are looking for a specif part number, please include it with your message.